This month’s self-published book review is of Dawn of Wonder, by Jonathan Renshaw, a 700-page novel of epic fantasy. Mr. Renshaw doesn’t need my help selling his book, as he’s sold over 200,000 copies, has over 2,500 Amazon reviews, and has won a bevy of awards. But it is a self-published book, and I was curious whether it could live up to the expectations. It is certainly a well-written book, with rich and poetic language and strong characterization. Aedan, the main character, is instantly likeable, adventurous and bold but with a grave weakness that will haunt him throughout the novel. We’re first introduced to Aedan as a boy, together with his friends, most notably Kalry, the daughter of the local noble. When tragedy strikes and Kalry is lost to slavers, Aedan is blamed, and his family has to leave the area. It is here that we are introduced to the source of Aedan’s fears and weakness, his father’s abusive temper. 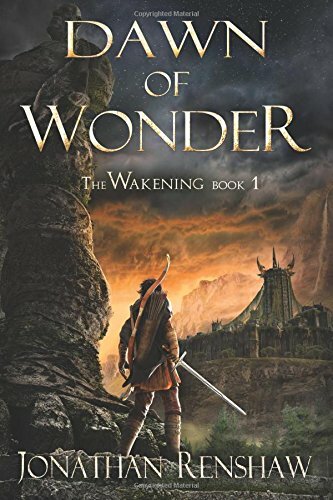 When they arrive in the city of Castath, Aedan’s father separates from his family to return to the criminal lifestyle he had practiced before marrying. Aedan quickly decides that what he wants is to become a soldier, independent of his father and the domineering woman his mother finds shelter with, and more importantly, able to pursue revenge on the nation of slavers who took Kalry. When he seeks out the training to become one, he quickly catches the eye of General Osric, and is offered a place at the Academy, studying to become a gray marshal, the spies and scouts who are Castath’s first line of defense. Believing that becoming one would give him an even better chance to avenge Kalry, he leaps at the opportunity. And it is here that the book bogs down, becoming more Harry Potter without magic than the epic tale of revenge I was anticipating. We learn a great deal about Aedan’s training, in more detail than we need. We also learn of the sort of antics he gets up to as a student, of which there are many, but mostly involving tame stakes. It is a credit to Mr. Renshaw’s writing that he was able to make those scenes interesting enough that I did want to know what happened next, but I found the school scenes much less engrossing than the few exciting outings, involving monsters and spies, that interspersed it. The book would have benefitted by cutting some of the training and class scenes and focusing on the adventures. One thing the school does provide is an opportunity to meet similarly minded young people. Among Aedan’s new companions are Peashot, a small, mischievous boy, tall, awkward Lorrimer, and headstrong Hadley. These marshals-in-training become Aedan’s friends and rivals, and play off his strengths and weaknesses very well. While Castath is not egalitarian enough to train women as marshals, there is a separate program for the queen’s envoys, training young women not just in languages and medicine, but in their own unique fighting style. Liru, one of those young women, is a foreigner with noticeably darker skin, and so an outsider among her classmates. She and Aedan gravitate toward one another, and her temper and quick wit help to keep Aedan in line. There isn’t a lot of magic in Dawn of Wonder. There are no magicians or wizards. There are odd, unexplainable events, such as strange bolts of light striking the ground like sustained bolts of lightning, and monstrous animals that may be related. But for the most part, the world consists of ordinary people faced with the threat of war, and training their utmost to be ready for it, with just bare hints that there may be something other out there. Near the end of the book, Aedan experiences what can only be described as a theophany. This is a turning point for Aedan, and the place where he starts to overcome his greatest faults. It is an important part of the book, and unfortunately not as original as I would have liked. I recently published an anthology of stories engaging with Christianity, so I’ve seen a lot of stories where God makes an appearance. Theophanies are hard to write, and the way Dawn of Wonder does it follows the conventions used in Christian speculative fiction a little too faithfully. I would have liked to see more of the strangeness, fear, and bewilderment found in the theophanies you read about in the Bible. Where the book works, it works really well, and events set up hundreds of pages ago can have significant payoffs. Aedan grows and develops in believable ways, maturing without losing that boyish sense of adventure, and characters like Peashot and Liru are great supporting characters, with their own faults and character arcs. But where the book falters, you’re left worrying about whether things will ever get moving again. I found Aedan’s brief infatuation with a fellow student to be particularly annoying. I’ve never seen anyone, even teenagers, experience quite that level of brain death the first time they fall in love. Thankfully, that section was mercifully short. There are also a few places where a professional editor might have helped. In particular, I noticed that Lorrimer just disappeared at one point during the winnowing process the Academy uses to choose only the best students. I was sure he had flunked out, until he suddenly showed up again later. Fortunately, the book gets more right than it gets wrong, and even the slow parts usually have compelling writing, so even when I got annoyed I still wanted to read more. Dawn of Wonder is available at Amazon for $4.99 for the ebook, and $14.96 for the paperback.